We had a fabulous show at Whangarei. The weather was great - as it always is in the winterless north. and the exhibitors were very happy to be able to get home at a reasonable ttime. 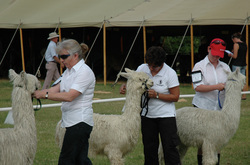 We were very pleased to be awarded Champion Brown Fleece as well as Reserve Champion Mid/Dark Fawn Suri.